Sometime last week Dan returned from an outing with Raven to our little pond, saying he’d observed River Jewelwings there. We were both familiar with Ebony Jewelwings, the iridescent green-blue damselflies with all-black wings. River Jewelwings are a close relative, but only the outer half of their wings are black. It wasn’t that I didn’t trust Dan’s observation skills – in many situations he’s far better than myself – but I’ve never seen River Jewelwings, despite having watched for them. Also, what were they doing at our tiny little human-made pond, instead of out along the banks of, say, an actual river? Dan offered to take me back to point out something else he’d found on the same outing (a future post subject – he’s great about finding blog fodder, it’s like having a second set of eyes out there) and we carried on to check out the jewelwings, too. And yes, they really were River Jewelwings. Delighted, I snapped a few photos before trying to get a bit closer, whereupon they promptly moved down the bank to an area surrounded by brambles. 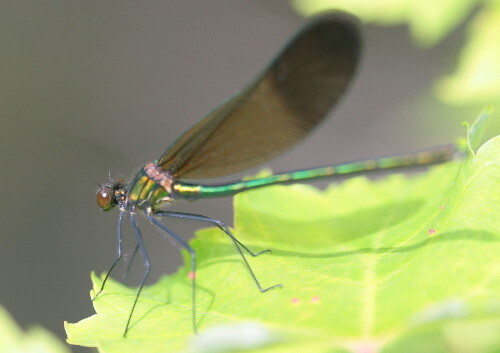 This one’s a male; females look nearly identical, but show a white rectangle (“stigma”) right near the tips of the wings. They’re a widespread species, absent from the far north and deep south of North America, but present nearly coast to coast within the middle band. The Stokes’ Beginner’s Guide to Dragonflies, which has a decent damselfly section as well, indicates that their habitat is “A variety of streams and rivers, especially swift and somewhat rocky streams.” Our little pond couldn’t get much farther from a swift and rocky stream without actually drying up altogether. Baffling. But I wasn’t complaining. While I was standing there, hopefully waiting in case the jewelwings might come back within lens-reach again, a couple of other odonates settled on the vegetation in front of me. 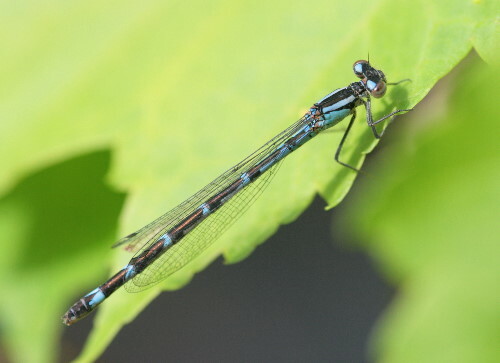 The first was another damselfly, this one a type of bluet. While most of the bluets are blue, not all of them are (some are black, a few are yellow or red; likewise, not all blue damselflies are bluets). In the case of this one, its predominantly black body bore only narrow blue rings around the base of each segment. Unusual among bluets is the fact that the two terminal segments of the abdomen were black, rather than blue. I thought this would make for a slam-dunk identification, but I struggled quite a bit more with it than I thought I would. Bluet identification often requires the examination of their external genitalia, which on an organism this small would require a magnifying glass or a good macro lens (and a cooperative subject). That said, I think this one is possibly a female of either Northern or Boreal Bluet, based on similar photos on BugGuide.net. Finally, a dragonfly, the chunkier members of the order Odonata. 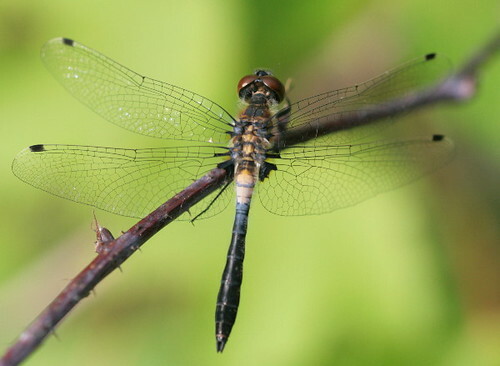 I browsed through both my dragonfly guides, as well as BugGuide, and drew a blank on an ID so I ended up uploading it to BugGuide to have someone else identify it for me. As always, I got a very prompt response, this one suggesting that it was likely a Frosted Whiteface, Leucorrhinia frigida. The species is found throughout the northeast, and appears to be relatively common. My Dragonflies Through Binoculars notes that the male’s thorax starts out yellow and becomes brown with age, and the dark abdomen gradually gets the white frosting at the base that gives the species its name. Their photo doesn’t show any yellow and I presume it’s an older male, while mine appears to be a younger one, which would be why I didn’t see it in the book when I looked. The book mentions that males defend territories of just 1-2 square yards from their preferred perch near the shore. It indicates that males mature (after crawling out of their larval skin) in four days, but doesn’t give any numbers for how long one might live (and defend his territory). I’ll have to look to see if he’s still hanging around in the same spot when I’m next back there. Wow! I love your photographs and descriptions. It made me laugh when you wrote about the River Jewelwings moving as soon as you tried to get closer – though I’m sorry for you that happened – that happens to me all the time with flying things! I laughed about them hanging out at the pond. Not the usual territory you’d expect. I?ll right away clutch your rss feed as I can’t find your email subscription link or e-newsletter service. Do you’ve any? Please permit me understand in order that I may subscribe. Thanks.